Bird flu has infiltrated some of the nation’s poultry flocks, leaving behind illness and death in its wake and an animal health crisis so severe that Minnesota’s governor has declared a state of emergency. Federal and state officials, in an effort to contain its spread, are “depopulating” hens and turkeys by the millions. As is typical with the factory farming industry, there’s been little thought of the suffering these animals are enduring. Nor is there much thought of who pays for the mass killing at the cordoned-off farms: we, the taxpayers. While the suffering to chickens and turkeys is incalculable, public health experts worry most about the effect the pandemic could have if it jumped species and infected the human population. For example, the H5N1 bird flu virus that emerged in Asia has killed more than half of the 800 people it’s infected over the last decade. And a similar bird flu epidemic in the Netherlands jumped from birds to humans and spread human-to-human, infecting more than a thousand people. But what’s the root cause of the bird flu problem in the first place? We now have abundant evidence that it’s inhumane, overcrowded conditions in the poultry industry, such as at Amon Baer’s facility in Minnesota, where an outbreak has been reported. Baer confines his birds in cages so cramped that they don’t even meet the threadbare voluntary guidelines created by egg industry officials. He was one of the few egg producers in the country who actively opposed federal legislation that would have phased in, over a reasonable time period, larger space allotments for laying hens. The legislation had the overwhelming support of egg producers, veterinarians, and animal welfare groups, and would have provided more stability for egg producers and consumers. How we treat animals can have global public health implications – and these new animal flu viruses certainly do. When we overcrowd thousands of stressed animals into cramped, filthy, football-field sized sheds, beak to beak and sometimes living in or above their own waste, we create breeding grounds for disease. That’s why the American Public Health Association called for a moratorium on factory farms more than a decade ago. 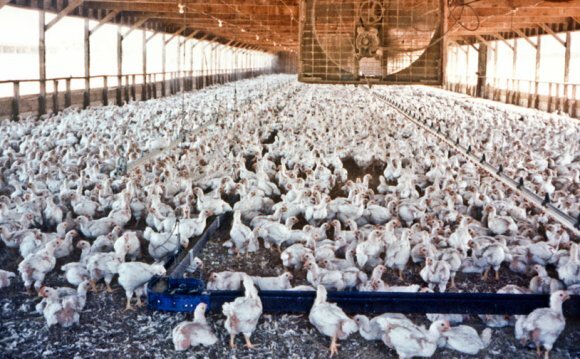 In 2005, the United Nations said that governments, local authorities, and international agencies “need to take a greatly increased role in combating the role of factory farming” which, they added, “provide[s] ideal conditions for the [influenza] virus to spread and mutate into a more dangerous form.” In other words, these factory farms can be thought of as the original incubators of dangerous strains of the flu. My colleague Michael Greger, M.D.—author of —calls factory farms breeding grounds for diseases: vast numbers of animals with immune systems weakened by unyielding stress, their lungs burning from ammonia emitted by decomposing excrement, and a lack of fresh air or sunlight. Put all these factors together and what you have is a perfect-storm environment for the emergence and spread of new “superstrains” of influenza. I encourage you to read on this flu outbreak in the Des Moines Register this week. Let’s take this current bird flu outbreak as an opportunity to stop and think whether we really want to continue allowing the poultry industry to operate in this way, exploiting immune-compromised and genetically-weakened animals and creating breeding grounds for disease that pose huge threats to humans and birds alike. What is a "Factory Farm" or "Mega Farm"? Why is factory farming such a big deal? Waikouaiti is a small town in East Otago, New Zealand, within the city limits of Dunedin. The town is close to the coast and the mouth of the Waikouaiti River.